As I've said before, the musical "Follies" has taken on mythic significance for me. It's a show I would go to see every day if I could, a show whose productions I will forgive a great deal just for the chance to see it, and a show that isn't produced nearly often enough. Within the past ten years, however, the number of "Follies" productions has picked up. I saw the Broadway revival in 2001, the one with Gregory Harrison and Blythe Danner as Ben and Phyllis and Polly Bergen as Carlotta, and I liked it far better than most critics. That was followed by a well-received Paper Mill Playhouse production with Donna McKechnie, and a 2007 version from City Center Encores! directed and choreographed by Casey Nicholaw that starred Donna Murphy and Victoria Clark, along with Victor Garber, Michael McGrath, Christine Baranski, Philip Bosco, Mimi Hines and Joanne Worley. This year, we've seen the Chicago Shakespeare Theatre production with lots of Chicago stars doing great work in their courtyard space, and a big, beautiful Kennedy Center production directed with all the bells and whistles by Eric Shaeffer that was successful enough to transfer from DC to Broadway, opening at the Marquis Theatre on September 12, 2011, forty years and five months after it opened the first time at the Winter Garden. Luckily for those of us who are besotted with "Follies" in all its incarnations, Tommy Krasker of PS Classics is just as smitten as we are. That means when he got the assignment to do a cast recording of the current Broadway production, he decided to (in his own words, in the album notes), "do an expansive recording that not only conveyed the glories of the score, but captured the experience of the show itself." To that end, Krasker has included pieces of dialogue to segue between songs or set up songs, to showcase the emotional context and character shadings of this exceptionally emotional, character-driven show. The result is one extraordinary cast recording. "I hope this new recording will speak both to audiences who've had the chance to see this glorious new production and to folks who might never get to see a Follies at all," Krasker writes. I fall into a middle category, with a few "Follies" under my belt, but not this one. Still, this cd captures the production very well, well enough that is almost a recreation, filling in the gaps for those of us who haven't made it to the Marquis for this "Follies." It feels like a complete experience because of the added lines of dialogue, lots of pictures in the booklet that accompanies this two-disc set, and liner notes from Krasker and arts journalist Patrick Pacheco on the significance of the show. Pacheco's theory that "Follies" and its crumbling theater are metaphors for America and its crumbling financial structures and institutions (or, as he puts it, "the deflated dreams and tarnished hopes now loosed throughout the land") goes a bit farther than I would, but the idea is definitely intriguing. Aside from all the lovely supporting materials, the score of "Follies," with Stephen Sondheim's searing lyrics and sweet, sad music, sells the cd all by itself. "Losing My Mind," "Waiting for the Girls Upstairs," "Too Many Mornings," "One More Kiss," "Beautiful Girls," "Broadway Baby," "Who's That Woman?" and "The Road You Didn't Take" all sound sensational here, with beautiful, emotional vocals that I can't listen to enough. And once again, from the first notes of the plaintive soprano saxophone (thank you, Jon Alan Conrad, for the information that it is a soprano sax and not an oboe so I sound like I know what I'm talking about) at the very beginning, I am hooked, transfixed and under the "Follies" spell. Its messages of bittersweet memory, early promise turned to disappointment, youthful passion marked by betrayal and delusion, are simply devastating. Beautiful, but devastating. Jan Maxwell and Danny Burstein both jump out in the best possible way, with Maxwell a silky, snarky Phyllis, the one who studied and read and walked her feet off at museums in order to be good enough for Ben, and Burstein giving vulnerability and a special spark to Buddy, the traveling salesmen who only wants the things he can't have. Bernadette Peters starts out sounding like the saucer-eyed, cutie pie Bernadette of days long past, like her "Dames at Sea" persona, convincing me she's right for Sally Durant, once a fun girl who ate Baby Ruths for breakfast, now "still playing games, acting crazy." I still don't like the way she goes up for the final note of "Losing My Mind," but otherwise, she honestly sounds awesome. At first listen, Ron Raines left me a little cold as Ben, the man who despises his own success, but then I listened again, and I can't imagine what I was missing. His voice sounds rich and resonant, as well as world-weary, on "The Road You Didn't Take" and his half of "Too Many Mornings" and right where he needs to be on "Live, Laugh, Love." Once again, I'm smitten. "Rain on the Roof" and "Ah, Paris!" are delightful from Susan Watson, Don Correia and Mary Peth Peil (quite the most elegant Solange ever), while I absolutely adore Jayne Houdyshell's cheery, no-nonsense trouper take on "Broadway Baby." Rosalind Elias and Leah Horowitz and are a perfect pair as the older and younger Heidi on "One More Kiss," really selling the "ravages of time" notion that Heidi's young voice can sing circles around her older one. I catch my breath every time when Young Heidi does exactly that. "Who's That Woman?" (complete with taps) also sounds great, but it's one of two places where no two-dimensional booklet is enough to fully communicate the experience of in-person performance. The dance is so important here, with the aged Follies ladies mirrored by the ghosts of their young selves, and I'm not sure that "wow" moment can come across in any cast recording. Pictures of the Mirror Dance (complete with ghosts) in the liner notes might've helped, but I'm still not sure it'd be enough. The other place I wanted more visual help is the young Ben/Buddy/Phyllis/Sally quartet. "You're Gonna Love Tomorrow" and "Love Will See Us Through" sound as spiffy as ever, but there is only a hazy image of the four behind the lyrics for those songs, and it's tough to tell what they look like or what era of costumes they're dressed in. I want more. Those are very minor quibbles, however, with what is, overall, an amazing package. 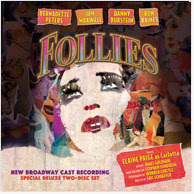 I don't see how any other cast recording can do as much to recreate the experience of seeing "Follies" live. For musical theater aficionados, this "Follies" is a must-have. For anybody who ever loved "Follies," this is a godsend. Bravo on conveying what makes this recording distinctive. Giving us a continuity of in-between scenes conveys the party atmosphere that pervades the start of the show (the little combo a constant background), but then fades away as we get farther in and closer to breakdown. But even more importantly, the bits of flashback and memory before and within several of the songs makes it clear that some of them (especially "The Road You Didn't Take" and "In Buddy's Eyes") are untrue -- the characters are lying, to themselves among others. I also think it's a nice touch that the image on the first CD is the four stars, and on the second CD it's their four younger selves. A real "Follies" fan needs this recording for the unique and wonderful way it conveys the continuity and complexity of the show, the Paper Mill recording (on TVT) because it has all the numbers complete, as well as an appendix of cut and alternative songs. And, yes, the original-cast recording, sadly incomplete as it is, because these are the performers for whom it was shaped. And even so, that trio of recordings denies me my two favorite Carlottas (Dolores Gray and Carol Burnett). There's no end to "Follies" mania. Silly me not to look at the pictures on the discs themselves! The picture you linked to of the kids doing their double duet is the one faded behind their lyrics in the booklet.